"From Snow, To Ice, to Rain, To Freezing Rain In The Northern Forest!" We have had very poor running conditions here and the dogs have not been run since the 17th of February! From last Sunday until the present, we have experience incredible weather here! The trails have all been hard packed and frozen making it impossible to run the dogs safely. For this reason and the fact the dogs haven't trained along with the weather forecast for more freezing rain, heavy rain for Saturday with temperature reaching +13 Celsius; We decided not to attend the race at St. Luc for the protection of the dogs against injury. As it turned out it was a good decision, as late last night and into this morning we had lightning, thunder, heavy rain/snow mix followed by freezing rain. The ground here is covered with a thick/icy crust. It is disappointing to have to cancel our plans to go to St. Luc as it was 720 days in the planning as we were unable to race last all last season due poor weather. ​That is life of a Musher! Our first responsibility here is the welfare of our canine athletes and we will not run them in what we consider harmful conditions. 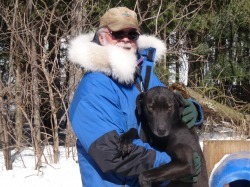 So, now we wait for some snow to fix the trails and prepare the dogs for our next race at Valcartier the middle of March. The above video is of our 4 Dog Team running here in better conditions. I am very proud and pleased with the performance of all our dogs and the development of our young leaders. As you can tell by the Title this week, we had a lot of snow days! Other than the plowing, clearing the roof of the chalet, it was a great week here running dogs. The above video is of Michele Vasquez running our 6 Dog Racing Team (Lead:Kira/Indigo,Point: Hok'ee/Yaluk, Wheel: Willy/Annie). I am very proud of all my Handlers (Michele Vasquez, Suzanne Morales and Annieli Deschamps) this year with their performance here assisting with the training as well as kennel maintenance and their ability to run small teams of dogs. Without their help, we would not have the well trained teams we have this year. This week, we got in the normal training as well as a long run on the Open Team to prepare them for the longer race next weekend at St. Luc. We also had fun running a 4 Dog Team with Anneli and Suzanne. More videos over the next couple of weeks of them running the 4 Dog Team. Today, the temperatures here have warmed up above freeing. "Sun, Snow And Frigid Cold In The Northern Forest!" It was another crazy week here with Weather! Monday and Tuesday were nice days with a forecast for freezing rain/snow starting on Tuesday evening and through the night. We were fortunate by not getting the freeing rain. However, we did receive around 15cm of snow with drifting due to high winds through the night and into Wednesday. The result Wednesday was a snow removal day. Thursday and Friday were frigid here with temperatures in the -20's Celsius during the day. Friday, due a heavy accumulation (76cm) of snow on the roof, we had to shovel it off because of the heavy weight. With the wind chill it was -30 Celsius. Saturday the temperature were more moderate with the morning in the mid minus teens. However, we were able to get in three runs on the Open Team and also the 6 Dog Team. All the dogs are running good and the dogs not running on the race teams were run in two 4 Dog Teams with Suzanne and Anneli driving the teams. The above video is the third and last instalment of the Open Team racing at L'Epiphanie. I hope you have enjoyed riding with us and getting a glimpse of the different terrain on the trail. "Normal Routine Returns To The Northern Forest!" Yes, a normal routine has settled back in here at Miortuk. Running all the dogs this week was as usual enjoying and rewarding seeing them coming further together as a team. Nova is improving with every run since we started bootying her. You can see her confidence and comfort level changing with every run. She is also embracing pet/interaction time in the kennel. Last week, we started to get Michele prepared for her first race. She got to run two 6 dog teams and on the second run being 4.5 mile run with the dogs we expect to be on her race team. The team will consist of Kira/Indigo at lead, Hok'ee/Yaluk at point and Willy/Annie at wheel. All of these dogs have raced on my Open Team. Last week, this week and next week, we will run a series of videos from our race at L'Epiphanie to give you the feeling of what it is like to run 10 race dogs on a nice track.